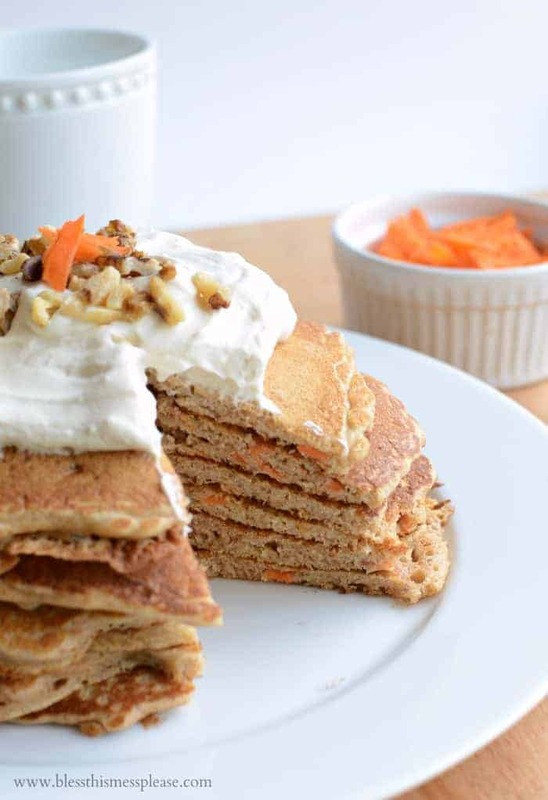 Whole grain carrot cake pancakes are full of spices and just the right amount of carrot. Top them with a simple maple sweetened cream cheese topping! I’ve been dreaming of carrot cake for weeks now and have been bugging my dad to send me the recipes he loves. While I’ve been waiting on his reply I’ve been making do with a healthy breakfast version of this delicious spring time treat. 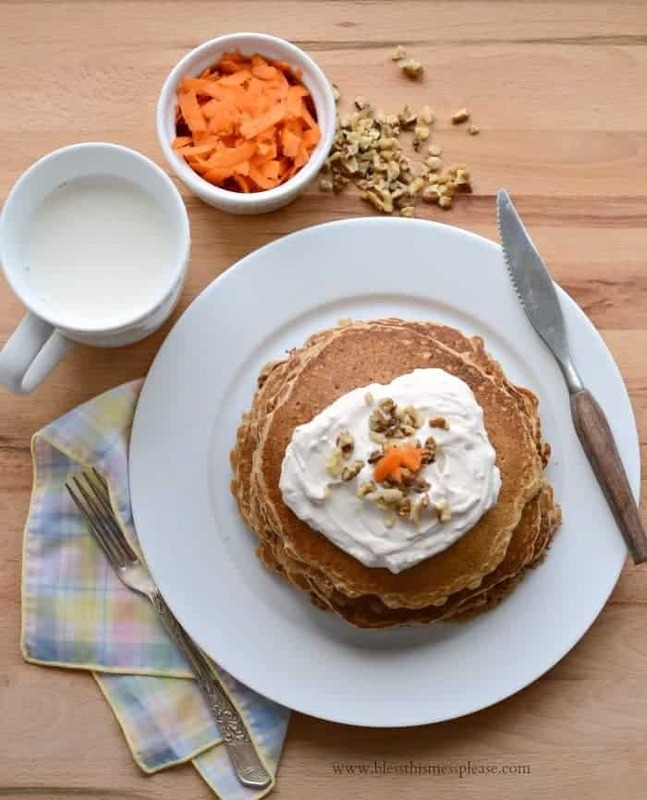 Whole Grain Carrot Cake Pancakes with Maple Cream Cheese Whipped Cream are the things Easter brunches are made of. 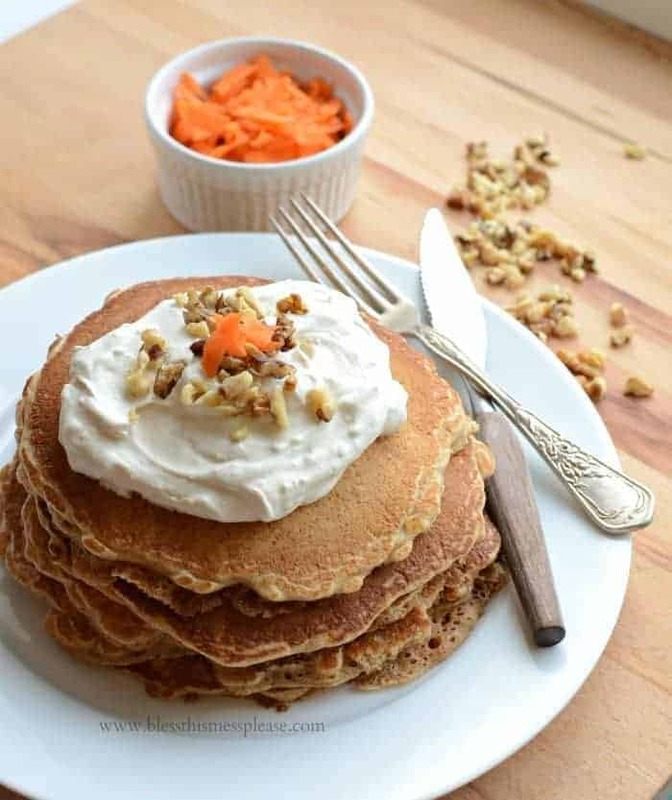 These pancakes are full of spices, just the right amount of carrot, and when you top them with a simple maple sweetened cream cheese and whipped cream mixture, you’ll think you are eating cake for breakfast. That’s never a bad thing in my book. The pancake texture will depend a lot on how big you grate the carrots. My grater has really large holes and so my pancake had a bit of a crunch to it. Truth be told, my 3-year-old hated it! He was not pleased with carrot in his breakfast. 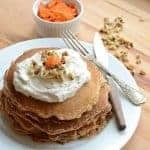 I, on the other hand, loved the texture and thought the pieces of carrot looked beautiful once the pancakes were cut into. If you think your kids may fuss at the idea, try grating your carrot nice and fine. And that whipped cream?! It was awesome! I had some leftover since my kids didn’t want it on their pancakes and I ended up dipping grapes and strawberries in it later for a snack. Delicious! Plus you can’t beat how easily it comes together and that it’s naturally sweetened. The pancake texture will depend a lot on how big you grate the carrots. My grater has really large holes and so my pancake had a bit of a crunch to it. If you don’t like that then try grating your carrot nice and fine. This could be caused from over mixing the batter. Don’t over mix! Stir your batter until the dry and wet ingredients are just incorporated. Heat a large cast iron skillet over medium heat. While the pan is heating, make your pancake batter. In a medium bowl whisk together the flour, baking soda, salt, cinnamon, nutmeg, and cloves. Make a well in the center of the dry ingredients and add the butter, vanilla, maple, eggs, and the lesser amount of milk. Whisk to combine. If your batter is too thick add the rest of the milk and stir to combine. Add the carrots and stir. Butter the hot pan and cook 1/2 cup of the batter at a time, flipping once, until both sides are golden brown. Repeat with the remaining batter. To make the Maple Cream Cheese Whipped Cream place all of the ingredients (cream cheese through cinnamon) in the bowl of a stand mixer and beat until light and fluffy, about 5 minutes. Serve the pancakes hot with the cream cheese mixture on top. Garnish with chopped walnuts if desired. If this isn’t sweet enough for you, serve with additional maple syrup. 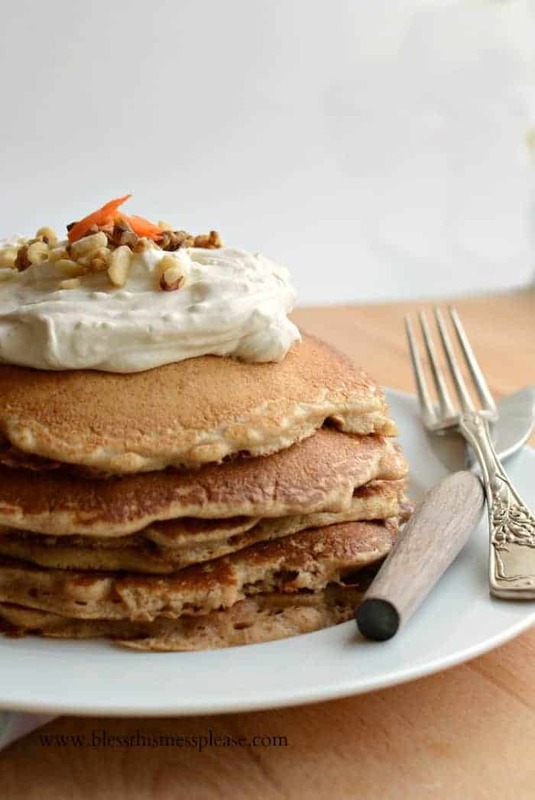 These carrot cake pancakes are full of spices and just the right amount of carrot. Top them with a simple maple sweetened cream cheese topping! I hope this gets your week started off on the right foot and I can’t wait to here if you try these. Enjoy friends! 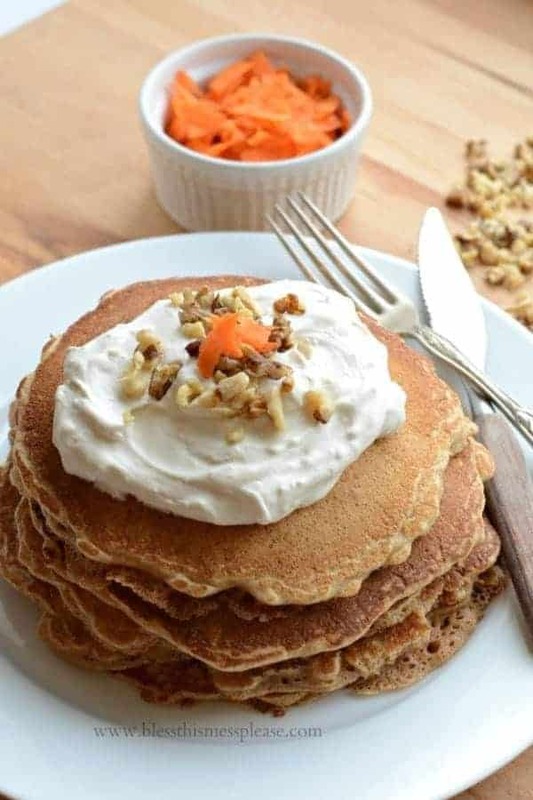 These pancakes are such a fun and creative take on carrot cake! The maple cream cheese whipped cream looks like the best part. I’d love to dig into a stack of these, with extra whipped cream of course! This looks delicious! My hubby loves carrot cake! I’m gonna have to try these! This must be what you were making when the boys destroyed the room? Hope you had a great time with your 7 house guests! Made these today (just the pancakes, I didn’t have the cream). My 2.5 year old, who is normally not a fan of pancakes, ate 5. I have to admit I made them more because my husband and I need to eat healthier… and husband, the pancake fanatic, loved them too. I made these today, but got right to the end and realised I didn’t have any carrots! So I grated a zucchini instead and they were delicious! Oh and I ran out of ordinary wholemeal flour so I used 1 cup of wholemeal spelt flour. My 1 year old gobbled them down. I’m super keen to make them properly with carrots now. The best pancake recipe I’ve ever tried! Thank you! Love that! Thanks for the kind comment!